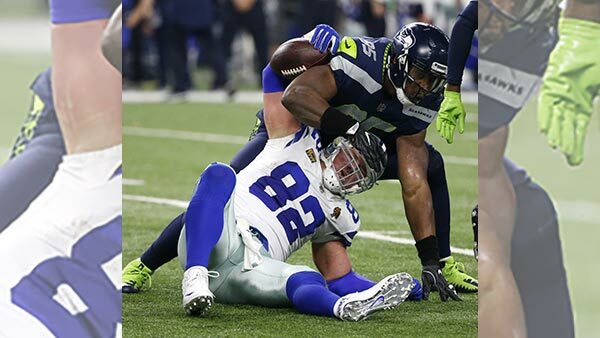 ARLINGTON, Texas -- Justin Coleman put Seattle in front for good with a 30-yard interception return for a touchdown and the Seahawks won a playoff elimination game against Dallas, beating the Cowboys 21-12 on Sunday in Ezekiel Elliott's return from a six-game suspension. The Seahawks were eliminated in the NFC West race by the Los Angeles Rams' 27-23 win at Tennessee. But they can still make the postseason with some help despite gaining just 136 total yards - their fewest since getting 135 in a 14-9 win over the St. Louis Rams in 2013. Coleman repeated an Elliott antic from last season, when the Dallas running back jumped into the jumbo Salvation Army red kettle after a touchdown on Thanksgiving. Coleman got the same penalty, too - a 15-yarder for unsportsmanlike conduct.